What you see above is the song release timeline of my iTunes Match library. This anecdotal data comes with caveats to consider before we analyze anything. iTunes Match limits libraries to 25,000 tracks. If you want to grow beyond that limit you have to start with a library at or smaller than 25k songs, then slowly add other tracks in. I’m still in the process of doing this and have around 12,000 tracks left. I do not know when or if iTunes will eventually stop accepting tracks, how about you? With that out of the way, I found the graph pretty interesting. For a period of time, the more money I made and the more available music was to me, the more music I bought. In this time period, digital music was only available through the purchase of CDs until the year Apple released iTunes and the iTunes Music Store. My music purchases skyrocketed in the early years of the ITMS. But why the drop years later? When the music industry made it easy for me to buy music, I bought it, and a lot of it! However, as streaming music services started popping up, my purchases dropped dramatically. If this trend continues, as more and others get into the streaming music business, I expect purchases to continue to drop. Based on my habits, the streaming music industry is killing the traditional music industry. What is good for consumers, in this instance, is not good for artists as streaming services pay oh so very little for each play, see the image to the right. Apple reportedly offered the Industry a streaming payout that is less than 1/3 the industry standard! This is remarkable. At the peak of my music purchases I was sending approximately $300 to the musicians, after iTunes and record label fees. These days it’s around $90 and dropping. Maybe my habit of streaming more music is unique. Perhaps the scale of streaming is so big that artists are actually able to make money. But if my habits are representative everyone else, what does this mean for the industry on a whole? Can recording artists and labels exist in a world of streaming when the money just doesn’t seem to be there? How viable is the future of services like Spotify, Rdio, Pandora, Slacker, Last.fm and the rest? If the record label rejects the current state of streaming revenue, will these services start to cost more? I’m curious as to which industry will break first. I just don’t see how it continue the way it is. Brick and mortar music stores… RIP? This entry was posted in Life, Nerdiness, Thoughts and tagged AudioGalaxy, Cyndi Lauper, Digital music sales, iTunes, ITunes Store, Last.fm, Music industry, Napster, online music sales, PANDORA, Rdio, Slacker, Spotify by Justin Scott. Bookmark the permalink. justex07 Now that I’ve joined Spotify Premium, I’m really not tempted to buy much music anymore. BenjaminDorsey I apparently am the same way, I just didn’t realize it. 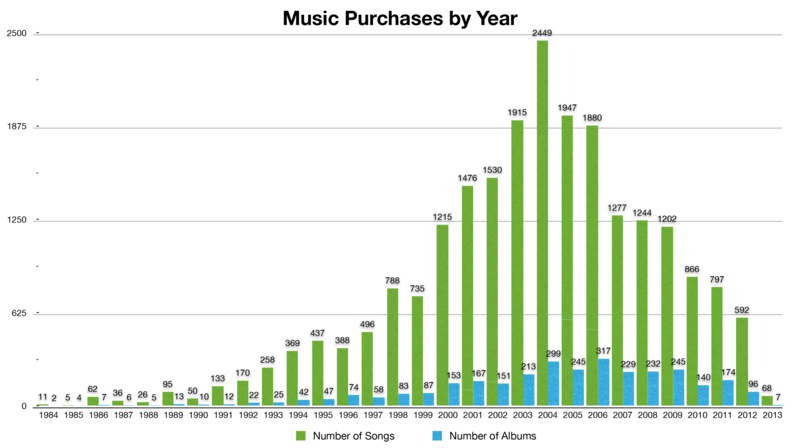 I thought I purchased more music but my graph says otherwise. drewmaniac justex07 …not if awful musicians kill it first! austinmcconnell drewmaniac haha yeah there is that! Maybe that’s why I’ve been buying less music after all! joanojr Never said it needed saving. I am simply asking the question of what will happen to the music industry, as we know it, if streaming continues to take people like me away from buying albums in favor of streaming them, at a SIGNIFICANTLY lower cost than purchasing the albums. How will this change the way artists put out their music? No one here has said they (the music industry) need saving. I don’t think they do, I think this is the nature of things, I was more curious what other people thought and whether I was unique in my music shopping as curbed by streaming.